Let’s look at some frequency tables. We will specify the variable num as the frequency weight. The tables reveal that 30 students applied for the Engineering program. Of those, 15 were admitted and 15 were denied admission. There were 18 male and 12 female applicants. Sixteen of the applicants had taken AP calculus and 14 had not. Note that all of the females who took AP calculus were admitted, versus only about half the males. Two-way contingency tables – You may need to use the exact option to get the Fisher’s exact test due to small expected values. Let’s run the exact logistic analysis using the exlogistic command. We will use the coef option to have the results displayed as logistic regression coefficients (in the log odds metric), rather than the default of odds ratios. As before, we will use num as the frequency weight. The first part of the output is the log, which shows how many records are generated as each observation is processed. For example, for observation 6 there are 536 unique combinations of the joint distribution for female and apcalc conditioned on the total number of cases. Note that the log lists only seven observations. This is because we input only eight lines of data, and one of those has a count (num) of 0. We use num as a frequency weight to expand the number of observations to 30. On the right side of the header information, we see that 30 observations were used in this analysis. We can also see that the overall model is statistically significant. The test of the overall model is a chi-square score, which is why it is called "model score". In the table we see the coefficients, the sufficient statistic, the probability, labeled 2*Pr(Suff. ), and the 95% confidence interval for the coefficient. The sufficient statistics are single-parameter tests of the null hypothesis that the coefficient equals 0 versus a two-sided alternative. The p-values and confidence intervals are computed from the exact conditional distributions. Note that unlike the estimates given in a regular logistic regression, which would be calculated simultaneously, the estimate of each independent variable is calculated separately with all of the other independent variables conditioned out. 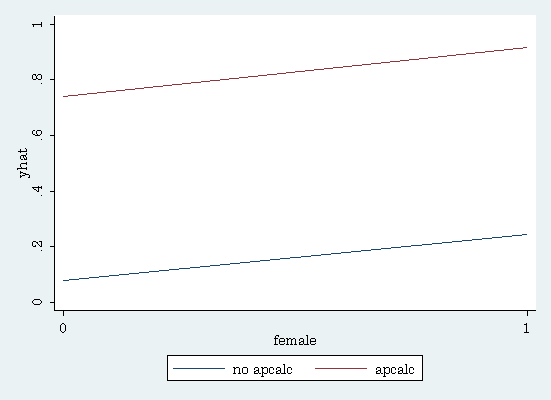 The variable female is not statistically significant, but the variable apcalc is. For every one unit change in apcalc, the expected log odds of admission (admit) increases by 3.34. The intercept is not included in the output because its sufficient statistic was conditioned out when creating the joint distribution of female and apcalc. We can issue the exlogistic command without the coef option to see the results displayed as odds ratios. The odds for an applicant who had taken AP calculus was about 28.2 times greater than for one who had not taken the course. We can also obtain the standard errors of the odds ratios using the estat se command. admit | Odds Ratio   Std. Err. You can use the test(score) or test(prob) option to have either the score test or probabilities test displayed. Below we show the probabilities test. We can also graph the predicted probabilities. To do this, we will create a new variable called yhat and set it equal to missing. Then we will replace the missing values for each combination of female and apcalc. Finally, we will use the twoway command to create the graph. Firth logit may be helpful if you have separation in your data. You can use search to download the user-written firthlogit command (search firthlogit) (see How can I use the search command to search for programs and get additional help? for more information about using search). Exact logistic regression is an alternative to conditional logistic regression if you have stratification, since both condition on the number of positive outcomes within each stratum. The estimates from these two analyses will be different because clogit conditions only on the intercept term, while exlogistic conditions on the sufficient statistics of the other regression parameters as well as the intercept term.